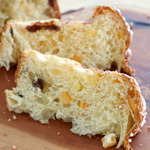 … all rolled (literally) into one crunchy little Italian wheel called a tarallo. I made 3/4 of the batch (using 750 grams of flour), and this still seemed like a lot of dough. The recipe says the fennel is optional. Not. I opted for the wine instead of egg, replacing 1.5 eggs with 75 grams of wine. I added about a cup (237 grams, give or take) of water in all. 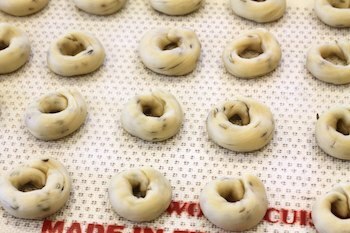 To portion the dough uniformly, I rolled thumb-thickness ropes about 24 inches long and used a dough cutter to cut them into lengths about 2 inches long, then rolled each piece to baby-finger thickness. In case you aren’t used to thinking in units of body appendages, this is about 1 centimeter or 3/8 inch in diameter. The dough is oily and I was worried that the joined ends weren’t going to stay together through the boiling and baking, but they did. I loved the charming way they had of sinking to the bottom of the boiling pot, only to pop up to the top with élan a minute or two later. They reminded me of my daughter’s little dog, who has springs for legs. I needed to bake my taralli for 40 – 45 minutes in order to get them brown. 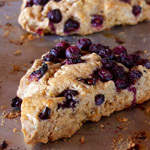 You will want to make these! And when you do, send them to Ilva before December 29 to gain Bread Baking Buddy status. 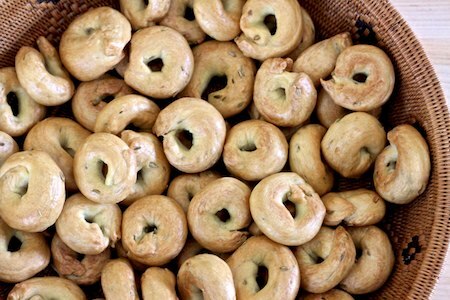 they look so lovely and I am very happy you like them, being such a taralli lover myself! And thank you for posting your comments! 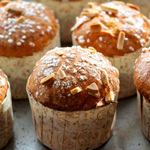 Hello, I was wondering if you ever use the Italian flour caputo type 00 in any of baking, I will be making them let you know how it turns out, yours look yummy! They look perfect! I love all the creative ways you presented them. Wonderful! That’s what I call multitasking at its best! 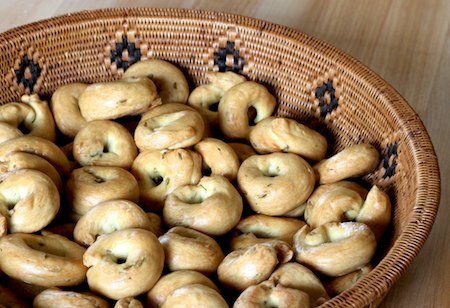 Nice post, I had never heard of taralli until now. 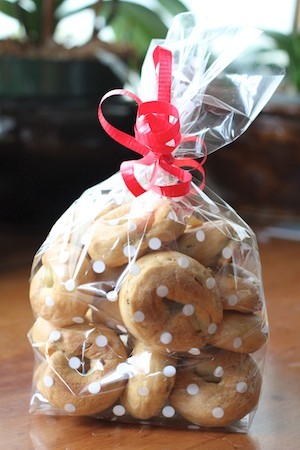 I love taralli at christmas time (and any other time as well)! 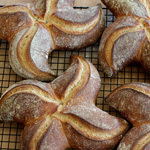 Very pretty looking Taralli ! We love the fennel as well but are having a LOT of difficulty deciding whether we prefer the plain to the fennel. And I really want to try Ilva’s peperoncino/chili oil idea too. Copy…print…run to the market to replenish wine & fennel seeds…BAKE!! These look right up my alley and I can’t wait to try them. This is perfect timing — thank you, Susan! 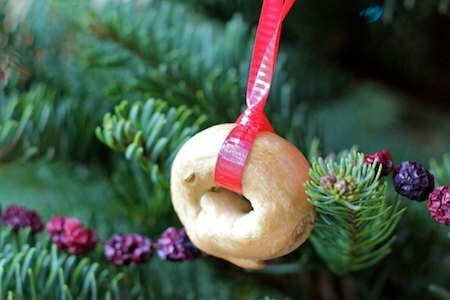 Super cute tarelli Susan…and they do make great gifts and ornaments the way you do it! Your’s are so cute!!!! I love the one on the tree! These were really fun to make. I just love the way how round the are, very pretty. Great idea to make them a gift too! Oh my gosh these are so darned cute! Great, lovely gifts! I love taralli but never tried making my own. You’ve given me inspiration to do so. Hello, if you want I give you the recipe for real the taralli. The ingredients are; flour, 500g 125 mililiter oil 400ml, white wine, salt and herbs will at as fennel seeds, chilli or rosemary. Mix all the ingredients and work the dough for about 20 mins. After that, he is going to call for the draft of the tarallini. Baking them at 190 degrees Celsius for 25 minutes. Look so marvelous that I cannot eat it.